It’s taken me about two weeks to even consider how to write this post. The mere thought of writing this news, and then sharing it with you causes tears to well up in my eyes. Yes, I’m a sentimental fool. As Hobbit King says, “Hobbit Queen, you wear your feelings on your sleeves.” And, sadly, he is right. We lost all five of our hives. 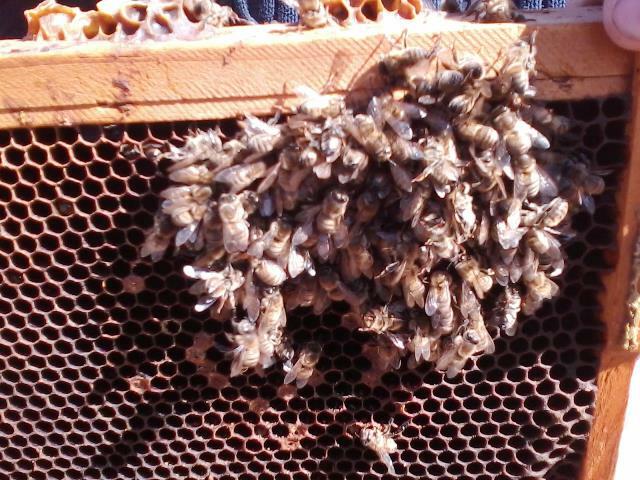 Sunday, February 23, 2014 was a nice, warm day to explore in our honey bee apiary. As we approached the hives, we became skeptical about how our bees might have fared. They were too quiet. Originally, we were going to peak at the bees, head back up to the house, put on our bee suits, and go back down to the apiary to check out the hives. But, our fears were confirmed when we moved into the apiary, without bee suits, and the noise was deafeningly silent. We knew from past experience that the apiary should have been humming with life. It wasn’t. We saw a single bee flying. We couldn’t confirm if she was one of our bees. After opening up a hive, we figured that the bee we saw most likely was a visitor coming to rob an empty hive. Yes, all five of them were empty. Deathly empty. The following pictures show what we found. I think the pictures speak to what we saw and felt much better than any words I can use to describe as we moved from hive to hive. They were all the same. Honey bees dead on top of frames of a hive. Small cluster of bees dead on a frame near a brood area. 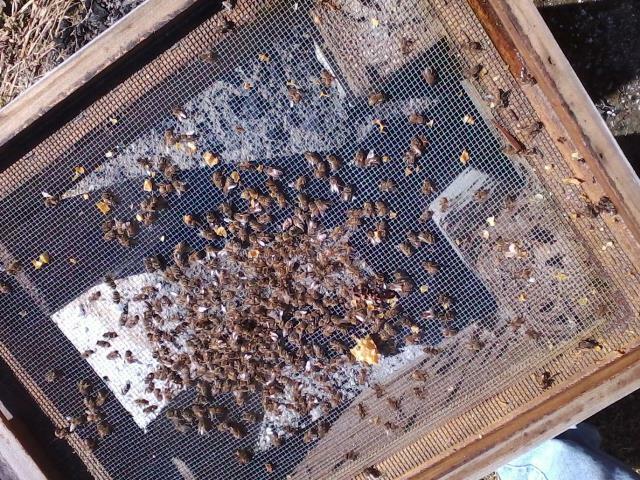 Honey bees dead on the screened bottom board of a hive. We really don’t know. We suspect several things came together for the perfect death sentence for our bees. The hives probably went into the winter weaker than we realized. We had a very damp spring and summer. We had repopulated four hives with packages and five new queens. If pollen and nectar are not available when the honey bees forage, then the queen senses the potential for starvation and backs off laying brood. Was this the cause? We don’t know, but we think it probably contributed to the beginning of their death. We had very cold temperatures with brutal winds this winter. The deep cold temperatures lingered longer than a couple of days. If the hive is weak, the cluster will naturally fall off in numbers and a vicious cycle begins of those bees on the outer fringes of the cluster dying off. The cluster gets smaller, and more bees die as a result of the cold reaching into the hive. 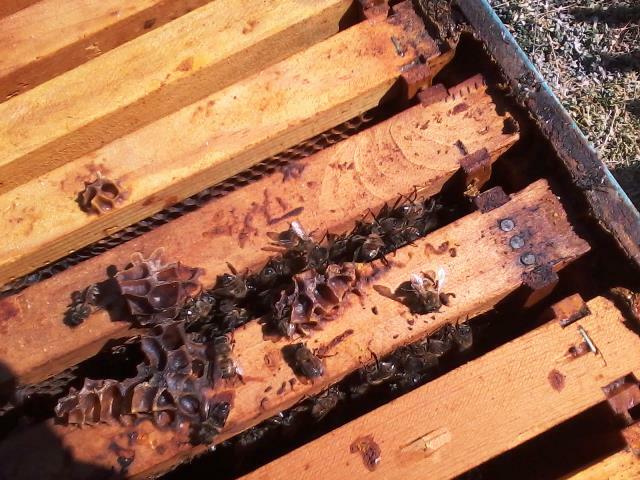 The small cluster remaining on a frame (See the middle picture above) and the large number of bees on the screened bottom board (See the last picture) suggests the bees froze to death because the cluster of bees was not strong enough to sustain the hive’s required temperature. Four of the five hives had nice stores of honey above the brood chamber. However, in all cases the frames down near the brood chamber were empty. Based on what we’ve been able to ascertain, this tells us that the bees may have starved, but we can’t say for sure. Despite food being only inches away, the honey bees will not leave the brood. The ladies will do all they can, including to die, to keep the brood warm and protected. There may have been an unusual draft issue with our hives. Our apiary sits down in a valley. The wind whips through. This winter the wind was especially voracious. We use a snow fence to block the snow and to break the wind currents. However, this may not have been successful. There could be other factors, such as varroa mite issues. But, we do not have any evidence that this was an issue. We are taking a break this year to reassess. There are many honey beekeepers that have lost hives. The cost to restock is at a premium. We think we will wait one year, as we also understand that this spring and summer will be another wet year for our area. We don’t want to repeat receiving bees late in the season, as we did last year, and then set the hives up for failure before they even have a chance to prepare for winter. We plan to continue to participate in our local bee association and to continue to learn about the honey bee, while we prepare to tackle raising bees next year. I will post to this blog as I acquire new knowledge, find leads on good resources that my followers will find helpful, as well as share updates on our plans. I know from comments I’ve received from many of you that my prior posts have been helpful. I do have several people who use the Hive Building 101 blog post as a reference to teach others. Hobbit King and I are still saddened by our loss. For me, it is almost as though I’m going through the grieving process, as silly as that may sound to some. I thought of our little ladies as anyone would. I loved them and took great pride in trying to do my part to offer them a place to forage and prosper. They brought joy to me as I’d watch them work and thrive. It breaks my heart to think I may have done something, or worse, not done something that I should have. With that, I sign off and wish all my honey beekeeper friends great success this coming year! Please post about your ups and downs, leave comments, and keep Hobbit King and I in the loop as you learn this year. We want to hear from you, too! We appreciate all honey beekeepers everywhere and look forward to getting back into the apiary real soon! So sorry to hear about your hives. Its difficult not to be sentimental about them, blessed little things. I think we lost ours too. On our few somewhat warm days when they should have been out, buzzing, there has been nothing. This winter was simply brutal. Negative 8 degrees here this morning, in the middle of March, for Pete’s sake. Its terrible. We learned a few lessons on what to do next year too. I guess we got too accustomed to mild winters and started taking them for granted. Lesson learned – the hardest way. Good luck in the year to come. Thanks for sharing. Hi Ruby, So sorry to hear you may have lost your hives, too. We just heard from a friend that is a first-year beekeeper. She had two hives and she lost one of them. This winter has indeed been extra hard. Blessings to you and yours and may you have good luck this coming year, too! You’re not a sentimental fool at all. As beekeepers we get so close to our bees. I would be absolutely devastated if this happened to me too. It could well be the case that the awful cold was the main cause. In the wild a large percentage of new swarms are unsuccessful, so it is a natural thing for some colonies to fail. It’s probably the case that there was nothing you could have done to save them. Some ideas that might help for next time – leave a super of honey underneath (with no queen excluder of course) if your bees prefer going down rather than up. Feed fondant above the nest – if you are particularly worried that they are short of food the fondant can be rolled into long sausages and dangled between the frames. Lots of insulation inside the roof, such as polystyrene or I think wood chips are often used in the U.S. – see Rusty’s instructions for a moisture quilt here: http://www.honeybeesuite.com/how-to-make-a-moisture-quilt-for-a-langstroth-hive/. A one-off drizzle of Oxalic acid in sugar solution (you can buy it ready made-up) can be done to reduce varroa mites in midwinter. Thank yo so much for your information from Rusty and the idea of using a super of honey underneath; both ideas worth exploring! The idea of reduce varroa mites midwinter is another piece of information to consider. Hobbit King and I have decided to definitely wait it out a year, regroup, and then determine how to start fresh next year. So, will keep you posted! Have an awesome year and I look forward to reading more of your “adventures in beeland”! Dear Ones, Fred and I were sorry to hear about your losses. We’ve been there and done that. It is good for you to wait out a year, as Fred and I did. We started our hives in 2011. We had started with two. Both queens were created by man. They were weak, did not make enough brood, and starved. Also, the Varroa mites were in epidemic proportions, so it looked as though they were doomed from the beginning. I did beat myself up mightily, thinking that I was just a big failure! Last June, (2013) which was late to start a new hive, I purchased a swarmed nuc from spikenard farms. What a difference it made to have the bees create their own queen! I went into September with many bees, however horrible the weather was. And Varroa mite population was super low! In October when the weather started getting cool, we did our winter check. Again, we had another surprise. Many, many bees… but the little ladies had almost no food stores left! I immediately started feeding honey water solution, and the first day they sucked it down! For the following week they sucked down every quart jar I put out at the front hive entrance! As it got colder and colder we decided to put an empty brood box on top of the hive above the vent cover and feed 2 quarts at a time. (Fred made a nifty little elevated box and cut two smallmouth jar holes in them to where we could feed two quarts at a time. Then we put the hive cover top over that and secured it with a block so it would not blow off in the always constant winds that we have blowing through our yard.) The first week they sucked down those 2 quarts! Then eventually they started eating less and less until finally one quart lasted two weeks. I would then change it out and put in fresh. They hardly ate anything during December and January but in February started once again and I am still feeding them as I write this. The tragedy is just two weeks ago they were doing really well in the temperatures of low 50s and were even foraging! To my surprise some of them even came back into the hive with Pollen on their legs. Where they got that only God knows! Then what happens? More cold weather and snow! So I bought some bee tea from Spikenard Farms, brewed some of the it and mixed it in with the honey water. Now that there is more snow on the ground, they are sucking this down big-time! I feel good knowing that they are getting some of the nutrients from the very spices and herbs that they will forage for when the weather decides to turn itself around! By the way, we changed our hive location closer to the house in the front where they will get more warmth from the morning and evening sun. I think this will make all the difference in the world for them! Just wanted to share a little bit of our experiences with you both, and to tell you to just “hang in there”! We learn by doing, and calling on their Creator many times (!) to help us help them. We’re praying for you both! Fred and Roxy, writing from Max Meadows (Wythe), Virginia. Roxy and Fred, thank you so very much for sharing your experiences. This is valuable information and so helpful to know we are not alone. I, like you, am appreciative of Spikenard Farms Honey Bee Sanctuary for all of their support for honey beekeepers, especially in our region. We will keep you posted on our progress, and please let us know how your hives fair this year. Wishing you and your bees all the best! I’m sorry to read about the loss of your hives. Thank you, Laurie. Please consider planting bee friendly flowers, which are good for pollinators to help the honey bees near you. Also, if you can, plant early blooming trees near your home, too, such as red maple. This time of the year is hard on honey bees trying to find food when the weather breaks. I feel your pain!! I lost both my hives this winter and I think it was what you experienced – late start, no build up. I will never do that again. This spring I am scheduled to get 2 Nucs from our local beekeeping association so they start out strong and can survive a winter. It is an expensive hobby! !